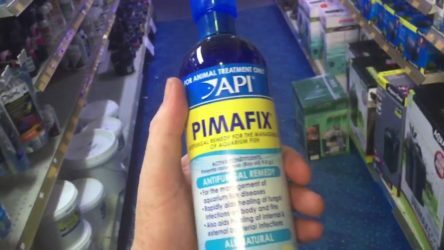 Pimafix from API is a product used to treat fungal infections in aquarium fish. Fungal infections can occur very often if the hygiene conditions of the aquarium are not respected, by hygiene conditions we mean regular water changes, removal of dead fish, removal of excess fish food from the bottom of the tank. The main ingredient of this product is an extract of the plant Pimenta racemosa which can be found in concentration of 1% in the product. Pimenta racemosa is well known for its anti-fungi proprieties. What do we use API Pimafix for? What are the main fungi infections we can encounter in an aquarium? Fungi tend to live everywhere, right now you can have a couple of strains even on your hand right now! Fungi is even used in food industry as starter cultures along with bacteria to make certain lactate products such as yogurt, kefir and sour cream. The white spot caused by Ichthyophthirius multifiliis is one of the most common problems in freshwater aquariums. As the name says, white spots will appear on the body of the fish. The cotton fungus is a disease characterized by small cotton like balls that tend to grow on fish fins and body. Internal organ diseases caused by the Ichthyosporidium fungi. The infection starts by attacking the kidneys and liver of the fish and then spreading all over other internal organs. To treat those infections, we can use traditional methods such as salty baths, but they often take times and sometimes prove to be inefficient. To compensate for that, pharmaceutical products began to flood the aquarium market, proving to be more efficient than traditional ones. One of those products is Pimafix by API. Pimafix is used to treat fungal infections, and the main component of the product is the Pimenta racemosa extract. This component is found in concentration of 1% in the product. Pimenta racemosa is a well-known natural fungi killer. There has been scientific research conducted about this plant and its capabilities to fight fungi, it has been used for a long time by humans. Pimenta racemosa, what is it about this plant? Have you ever wondered what that strange smell from the old shaving lounges is? Do you remember the hot and humid air coming from the hair dryers and from the moisture that was ever present there? The heat and moisture emitted amplified the smells of “hairdresser and shaving” that earned notes of cinnamon and cloves –that smell that made your friends ask if you were at a barber shop? Well this is the smell of rum bay, a genuine and traditional odor used today by some men who follow the style of old fashion barbers. This fragrance originates in the Caribbean area, and two plants are used for its production: Laurus Nobilis, a Mediterranean herb (whose leaves are also used for taste and aroma by chefs from all around the world) that is used after processing and as massage oil, aftershave, skin cleanser and detoxifier, and the second plant is Pimenta Racemosa that grows in the area of the Caribbean known as rum bay tree. The best rum bay lotions are produced in the West Indies. But Pimenta racemosa is more than a simple odor, its antibacterial and anti-fungi proprieties are what makes this plant so special, and by deciding to incorporate it into Pimafix, a great natural mixed product was created. There are mixed opinions regarding the effectiveness of Pimafix, some aquarists claim they have resolved their fungi problems by using Pimafix and some other advice against using it because it threatens the life of fish and plants, but that depends on other factors as well, maybe Pimafix isn’t the main reason for the death of some fish. The product claims to cure the main fungi infections that can threaten the life of aquarium fish such as cotton wool disease, white spot disease, fin and body rot disease (this is not mainly caused by a fungi but rather by a bacteria). The duration of the treatment is specified on the product label and it can range between 5 and 7 days. On the 7th day it is recommended to do a 25% water change to remove some of the substance from the water. The main issue comes with beginner aquarists who tend to lose their patience when the product does not give results. No product ever can cure a disease with a flick of a finger. That also depends on how advanced is the disease, if it is diagnosticated right away and the product is applied, there are very high chances that the disease will be cured. If the disease is in a more advanced stage or in a terminal phase, applying the product will not provide any good results, it may ameliorate the symptoms a bit but that is all. Is Pimafix safe for my aquarium fish and plants? Pimafix claims to be a natural mix of Pimenta racemosa extract but that doesn’t mean it is 100% safe. Different adverse symptoms can occur in some individuals, some of them leading to death. We do not recommend combining it with any antibiotics when using eat to treat small bacterial infections (yes, although it is an anti-fungi product, it can be used to treat small bacterial infections). There are aquarists claiming that Pimafix is not safe for shrimps and for aquarium inhabitants that are breathing through the skin. That claim can be true, because of its antibacterial proprieties, if the product is absorbed through the skin, it can travel into the fish digestive tract and kill most of the beneficial bacteria that are living there. Although there are mixed opinions on this product, API Pimafix is a great alternative to traditional methods of curing fungi infections. When used correctly and according to the manufacturers instructions it can prove to be a fast and effective cure for our aquariums.